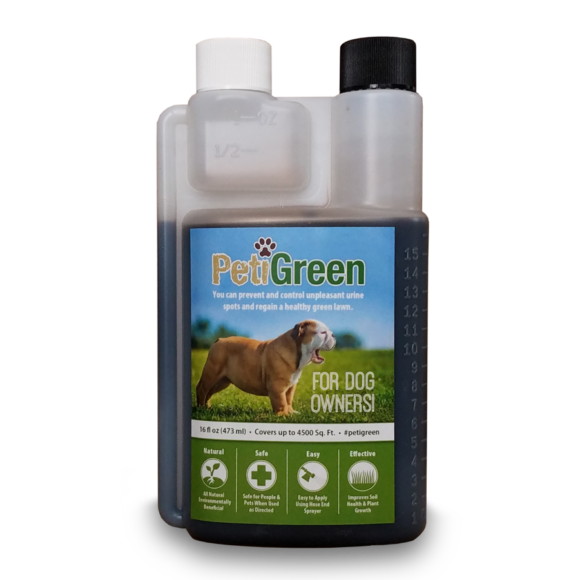 With regular applications of PetiGreen every 6 weeks most customers see an improvement in the overall health of their lawn and a lessening of new pet urine spots within a few weeks when used as directed. Lawns with severe urine damage or an excess of fertilizer accumulated in the soil can take longer. Existing dead spots should be reseeded 3 weeks after applying PetiGreen and then as new spots appear. Easy to apply using a hose end sprayer. Effective at preventing dog urine spots by improving soil health. A PetiGreen yard isn’t just a spot-free lawn. It’s a healthier, greener, thriving soil and plant life environment.Most PetiGreen users initially try to control the pet urine spots in their lawn, but quickly realize that the list of benefits is much longer. Improve the overall health, color and growth of your lawn. Help reduce the amount of thatch buildup in the lawn. Promote better water utilization and ability to handle hot summer months. Help neutralize the soil pH level. Help establish new sod and newly seeded lawns. 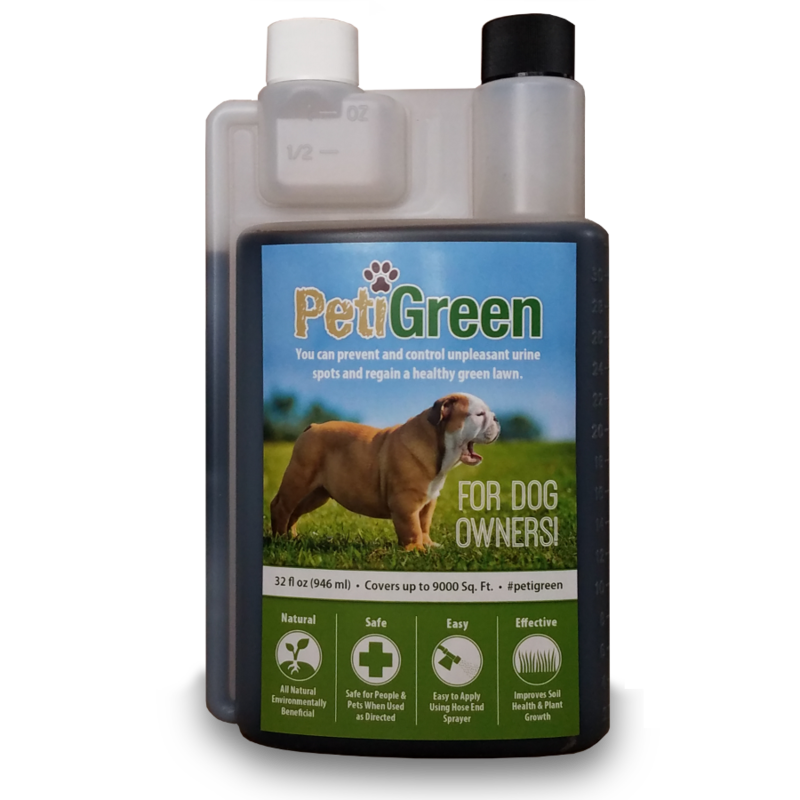 PetiGreen can help you restore a healthy biological environment in the soil. Dog urine damages the lawn because it can contain up to 46% nitrogen, which is similar to spilling a handful of fertilizer on the grass. This high concentration of excess nitrogen will kill the existing grass and prevent new grass from growing until the nitrogen can be digested by the bacteria in the soil. Most lawns do not possess the thriving bacterial atmosphere that is needed to handle the excess nitrogen added through dog urine. Because the soil’s digestion system is biologically active, it can quickly become unbalanced under such harsh conditions and deteriorate with frequent applications of dog urine. As this destructive cycle continues, the health of the lawn will deteriorate into sparse growth with abundant urine spots. PetiGreen can return your lawn to a healthy greenstate by breaking down the excess nitrogen from dog urine before it can burn the lawn, while also preventing new spots from occurring. The soil’s biological activity will increase and enable it to digest and filter the large amount of nitrogen added by pet urine. 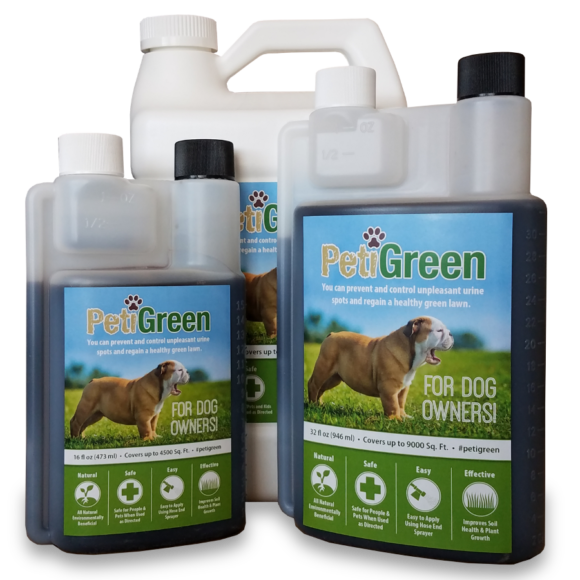 In other words, PetiGreen is an easy to use solution to a difficult problem. 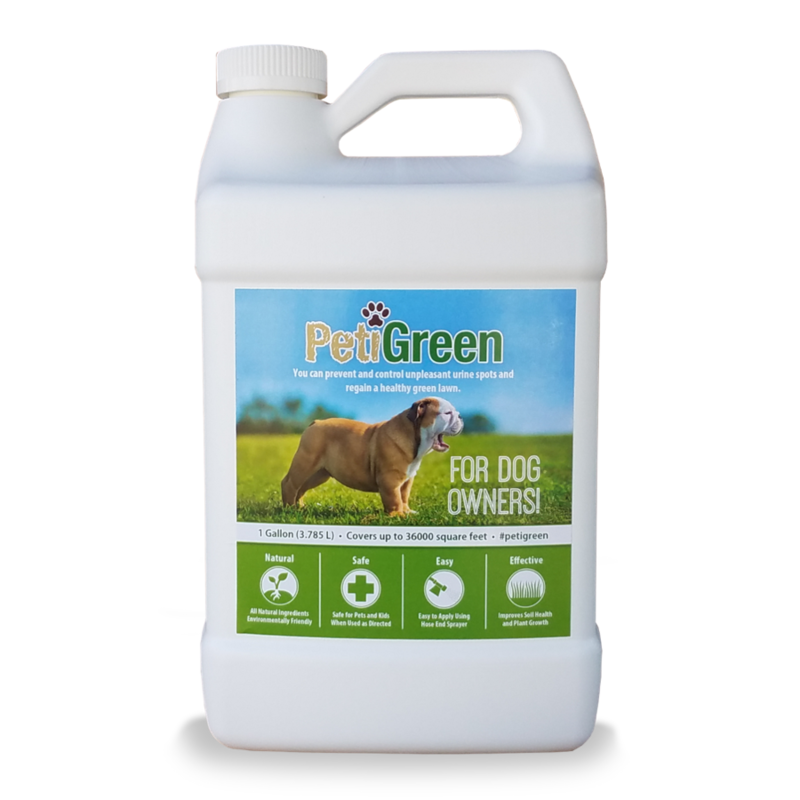 PetiGreen, when used in conjunction with smart fertilization practices, will give you a thicker, greener lawn as well as a deeper, more urine-resistant root system that translates into the continued reduction and prevention of pet urine spots and lawn damage.